Auburn Health Strategies was founded in 2003, by Robin Stombler. Ms. Stombler serves as President of the firm. Prior to establishing Auburn Health Strategies, Robin Stombler served as the Vice President of Government Affairs for the American Society for Clinical Pathology. In that capacity, she represented the interests of 140,000 board certified pathologists, clinical scientists, medical technologists and technicians, and directed the ASCP Washington Office for over nine years. Stombler previously served as a Senior Washington Associate for the American College of Surgeons. A veteran of Capitol Hill and state government, she has participated in a number of local community activities. Stombler has served on the community affairs committee of a local hospital, and is a Past President of the Arlington Committee of 100, a forum for civic leaders. Jefferson Medical College’s Department of Health Policy appointed Stombler a Senior Scholar for 2006-2007. She is a member of the Washington Academy of Sciences and served on the Board of Directors of Women’s Health Virginia. Organized the Consensus Conference on Second Opinions in Diagnostic Anatomic Pathology and co-authored subsequent report in the September 2000, edition of the American Journal of Clinical Pathology. Awarded a cooperative agreement from the Centers for Disease Control and Prevention for the enhancement of laboratory testing practices and development of laboratory preparedness activities for pathologists, medical technologists and technicians. Proposed a bill to address the laboratory personnel shortage, which was ultimately introduced as HR 623, the Medical Laboratory Personnel Shortage Act. Co-chaired the Patient Safety Workgroup of the Alliance of Medical Societies, a group of 13 medical specialty societies profiled in the National Journal, and praised by members of Congress. Provided strategic direction for establishing the Institute for Quality in Laboratory Medicine, resulting in over 70 organizations and corporations joining this public-private partnership in its first year. Participated in federal Negotiated Rulemaking Committee for Clinical Laboratory Tests. Led consecutive successful legislative efforts to oppose a physician office laboratory exemption from the Clinical Laboratory Improvement Amendments of 1988. 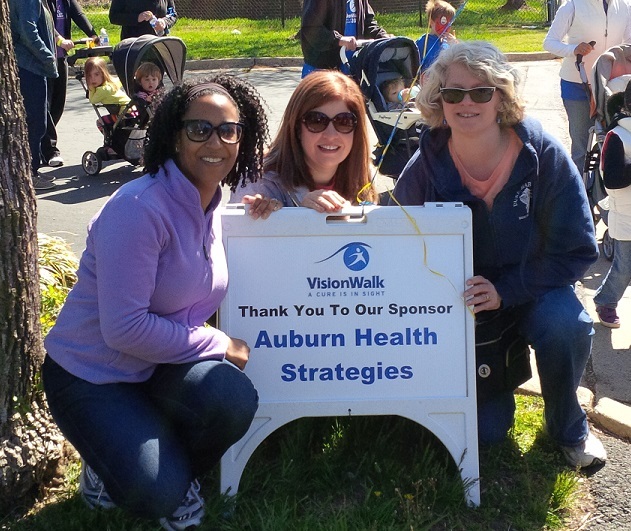 Auburn Health Strategies supports research efforts to cure retinal degenerative diseases through its VisionWalk team.